The United Kingdom has borne witness to a growth in reported hate crime. This is demonstrated in up-to-date figures regarding the number of instances of police-reported hate crimes in England and Wales. 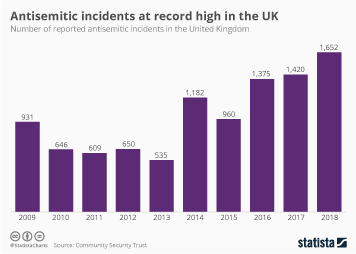 This trend was also mirrored by similar statistics referencing the number of police-reported hate crimes in Northern Ireland, although figures regarding racial hate crimes in Scotland suggest that of recent years, instances of racial hate crimes have been on the decrease. A very similar pattern of decline also occurred in the number of religiously aggravated crime charges reported in Scotland, in defiance of a rather substantial growth in 2011/2012. Furthermore, data regarding religiously motivated hate crimes in England and Wales (by offence type) demonstrated that most transgressions were public order offences, the majority of which would have most likely been recorded in London, as denoted by a statistic showing the regional distribution of religious hate crimes in England and Wales during 2015/2016. Most of the 65,500 hate crimes recorded by the police in England and Wales throughout 2015/2016 were motivated by racial factors, according to data highlighting the number of hate crimes in England and Wales, the greatest quantity of which were public order offences based on figures about the number of hate crimes motivated by race in England and Wales (by offence type). However, the number of hate crimes involving racially aggravated harassment and behavior in Scotland illustrates the fact that 1,765 instances of such behavior were reported to the police in 2015/2016. This occurred after a continual and sizeable overall downturn in the annual rate in the years following 2011. During 2014/2015 the number of police-reported crimes with a racist motivation in Northern Ireland reached 851 instances, the majority of which were discriminations against residents of white ethnicity. Further analysis presenting the number of crimes with a racist motivation in Northern Ireland shows that almost exactly one quarter of victims came from the UK and Ireland, this was then followed by Polish victims, 155 of which reported to police they had experienced a racist hate crime.